When you advertise with Google AdWords, you'll link your online ads to your website. If you don't already have a website, you can create one for free using Google Sites. If you don't want to create a website, you can create a local page with Google My Business and advertise with AdWords Express. 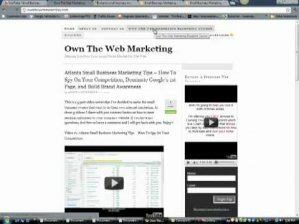 In order to advertise with Google AdWords, you need to have your own website. Your online ads will link to this site, and you can use it as an opportunity to let customers know more about your business. When you create a site using Google Sites, the system generates a URL like this: . Then, when you create your first ads, you can use this URL as the address of your landing page. Google Sites is a free online application that makes creating a website as easy as editing a document. The customised site you create can be the landing page for your AdWords ads. Sign in with your Google Account. If you don't have one, click Create an account and follow the steps to create a Google Account. Click the Create button to get started. When making a website for your business, consider what information is most useful to your customers. This often includes opening hours, location and product information. It's also helpful to use words that customers might use to describe your business. AdWords Express allows you to advertise a local business on Google and Google Maps (including mobile devices). To get started, check the list of countries where AdWords Express is currently available. With AdWords Express, you’ll set up a monthly budget for your ad, and we'll determine what search phrases can trigger your ad based on the categories that you select. You'll only pay for the clicks that your ad actually receives. Jingle Networks, Inc. is an American media network offering a free directory assistance service called 1-800-FREE-411. Contact info@lourelcholdings.co.za / 0810852334 if you would like to advertise/Market your business/Events onto Lourelc website. @myhermes we are a Yorkshire based website for working mums. We'd love to advertise your jobs roles - who do we contact?